The Obama family is spending its summer vacation in Martha’s Vineyard off the coast of Massachusetts. Other travelers interested in visiting the island can find maps in the GIS Research and Map Collection (GRMC) on the second floor of Bracken Library. Rand McNally published a map of Cape Cod and its vicinity that includes a map of the island of Martha’s Vineyard. J. Donovan’s detailed road map of Martha’s Vineyard and Dukes County, Massachusetts, includes blow-up maps of Edgartown, Tisbury, and Oak Bluffs. 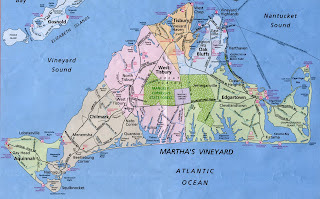 Miller’s Map of Martha’s Vineyard includes detailed maps of Chapaquidick, Chilmark, Edgartown, Gay Head, Oak Bluffs, Tisbury, Vineyard Haven, and West Tisbury. Martha’s Vineyard and Nantucket Handiguide Road Map is a water-resistant map with a guide to the area’s finest beaches, historical sites, and recreational activities. The GRMC also includes a bird’s-eye view map of Edgartown as it appeared in 1886. Several nautical charts at varying scales in the GRMC include the island of Martha’s Vineyard. Also, travelers can check out an atlas with illustrations and maps of the area, Universal Atlas of Cape Cod and Southeastern Massachusetts including Martha’s Vineyard and Nantucket. Maps from the GRMC circulate for two weeks or longer. Atlases from the Atlas Collection circulate for four weeks or longer. The GRMC is open Monday through Friday from 8:00 A.M. to 5:00 P.M.